Central American migrants traveling with the annual Stations of the Cross caravan march to call for migrants' rights and protest the policies of U.S. President Donald Trump and Honduran President Juan Orlando Hernandez, in Matias Romero, Oaxaca State, Mexico, April 3, 2018. Central American migrants take a break from traveling in their caravan, as they journey to the U.S., in Matias Romero, Oaxaca, Mexico, April 3, 2018. 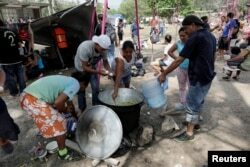 Central American migrants prepare food as they take a break from traveling in their caravan on their journey to the U.S., in Matias Romero, Oaxaca, Mexico, April 3, 2018.